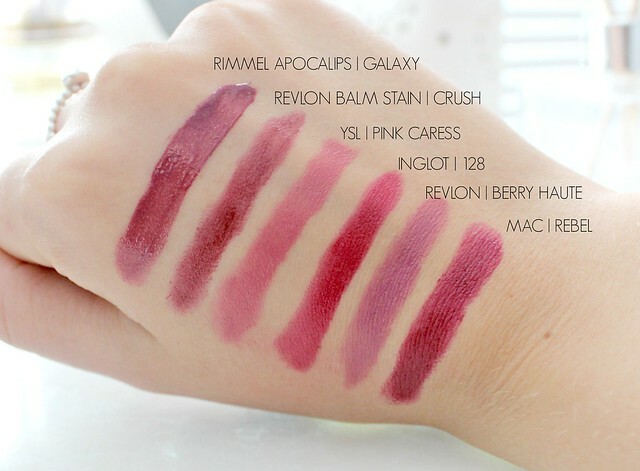 I really love 'crayon' style lip products and this one from Revlon is a firm favourite. The shade 'Crush' is the perfect vampy winter shade and due to the name, it always reminds me of crushed red grapes. Is that really weird? That's how I'd describe it though - a deep purple with a hint of berry pink coming through. I also find it really pigmented, long-lasting and easy to apply due to the crayon applicator. The finish is semi-matte as there isn't a great deal of gloss but it certainly isn't drying either. I'd actually like to get my mitts on a few more of the Kissable Balm Stains as this is the only one I have currently. When the Rimmel Apocalips lip lacquers were released - I went a tad crazy for them and bought almost every singe shade. They were quite a novelty for me as they're unlike any other lip product I'd tried before - a lipstick/stain/gloss hybrid. I was totally intrigued by them and I have to say, they didn't disappoint. Other than being quite messy - they're one of the most pigmented, glossy and long lasting lip products I've ever tried. Galaxy is the only deep shade of the bunch with the rest of them being vibrant corals, pinks and reds. Its a great dark purple shade with a hint of shimmer and the long lasting formula makes it idea for all those parties and late nights in the lead up to Christmas! YSL lipsticks are the ultimate luxury in my opinion and their exquisite gold packaging and highly pigmented creamy formula is second to none. As much as I love MAC, YSL are truly in a league of their own when it comes to lipstick. Pink Caress was the first YSL lipstick I got my mitts on (I now own three) and I got it around this time last year when looking for the perfect A/W lip colour. 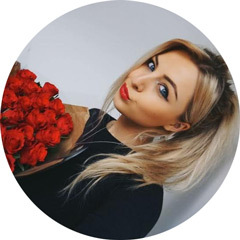 Its an absolutely beautiful rose shade with hints of pink and purple and it can be worn on a day to day basis or in the evening with a smokey eye. I love it! As I mentioned, the formula is exceptionally creamy so they do have a tendency to wear off fairly quickly but I can't say I mind pulling this beautiful product out of my handbag to re-appy! When I was visiting my family in Australia last year, I couldn't contain my excitement when I discovered the shopping centre I was visiting had an Inglot store. It isn't a brand I see mentioned a lot and I think that's down to the fact there's only one Inglot store in London (how inconvenient) but it had always been a brand that was on my radar so I took full advantage while I had access to a store a bought myself a few treats including this beautiful lipstick. As soon as I spotted it amongst the mass of other shades, I had to have it. My favourite shade to wear on my lips is a berry pink, without a doubt. The likes of MAC 'Girl About Town' and Revlon 'Lollipop' lip butter are perfect examples of the berry pink shade I love and this Inglot lipstick is in that same beautiful berry pink family. I also love the scent and formula of this lipstick - it smells amazing (like pick and mix sweets) and its very pigmented and moisturising. I must get my hands on some more Inglot lippies - I just wish there was more stores in the UK so I could go and have a swatch! I was clearly going through a berry/purple lip faze whilst in Australia last year, as here's another lovely lipstick I bought whilst down under. I'm not sure if this shade is available in the UK as I looked on the boots website which I've linked above and could only see one named 'Berry Couture'. The shade looks very similair though so maybe it has a different name in the UK or Revlon decided Couture sounded nicer. I must admit, Couture is obviously a better word ;) muhaha! Anyway, silliness aside, this is a beautiful lipstick. This is probably the most lilac shade of the bunch and I'd say you have to be into bold and daring shades to enjoy this one but I personally love it as its such a unique shade. The pigmentation and formula is incredible too - Revlon are always bang on the mark with their lip products and this one is no exception! If I had to pick my ultimate and most worn Winter lipstick, MAC Rebel would be the one. Since winning this lipstick in a fellow bloggers giveaway, I've worn it countless times for many occasions and I'm still in love with it. Its a pretty vampy shade and not one for someone who favours a more natural look but if you love bright and bold shades, you'll love Rebel. Its a deep purple shade with hints of berry pink which is what I love about it so much (told you - I'm berry pink obsessed). You can create quite a range of effects with this lipstick too from a subtle berry stain to a full blown vampy goth look. I usually like to wear it somewhere between the two but its definitely a versatile lipstick and not as scary as it looks in the bullet! I'd also like to mention that the Rimmel Kate Moss lipstick in the shade 107 and Topshop 'Wicked' are two more Winter favourites of mine but I unfortunately couldn't find them to photograph for this post. I assume they'll be lost in the bottom of a handbag somewhere the pesky little swines. 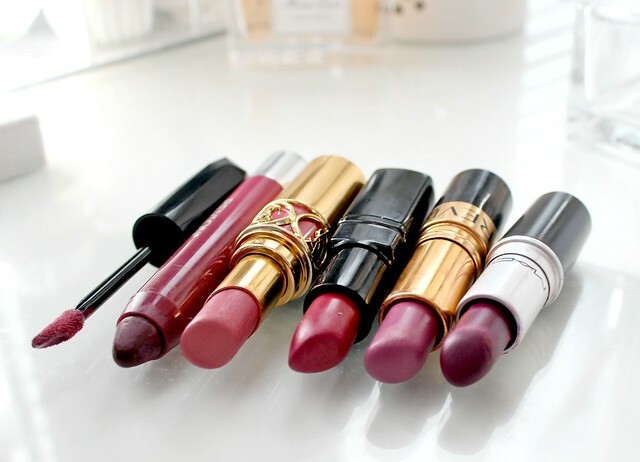 What's your favourite lipstick for Winter? 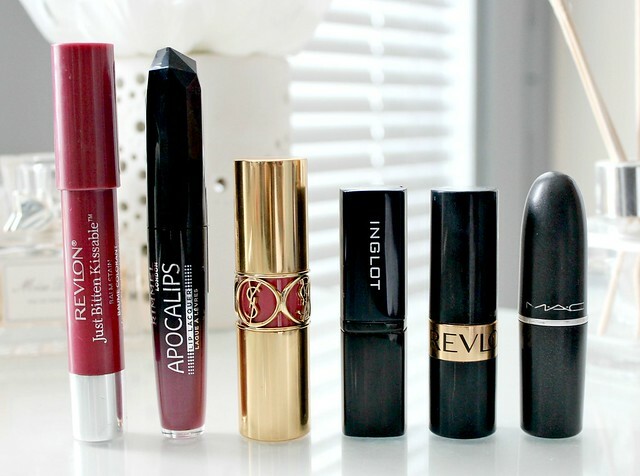 Do you own any of these shades? I'm coveting the Crush shade of the Revlon Just Bitten Kissable Lip Balm Stain! I have three other shades of this product and love them but with the exception of one which is a mauve colour they're very summery shades, this one looked perfect and I was searching for a swatch to see if I was right before I bought it and it looks lovely in your picture. Just how I'd imagined. One of the few reasons I can put up with this cold weather is the gorgeous berry shades this season allows us to wear, great post loads of inspiration here. Love all these shades! YSL lipstick is divine! Might have to add this shade to my christmas list! Those colours are gorgeous, great selection! Love the picks and swatches. I need to try that Inglot shade, or an Inglot lippie in general!! Is it quite moisturizing? or just lightly so? I need to try Rebel. It looks like a gorgeous shade! Some lovely shades, particularly like the apocalips. Desperate to try MAC Rebel and the new Rimmel Apocalips shades! I love berry lips and all those lip colours are beautiful. Would love it if you can have a look at my blog and follow too. That revlon balm stain in crush looks gorgeous! I have it in smitten but this might be the next color I pick up! I lovvvee YSL Pink Caress. I havn't worn this in a couple of months but will definitely wear this sometime soon. I'm not a huge lipstick girl.. but these shades are stunning! You're so lucky that you've won the Rebel from MAC. That's my absolute favourite.. I've bought so many lip colours recently but you've added lots more to my list ;) Great round-up! 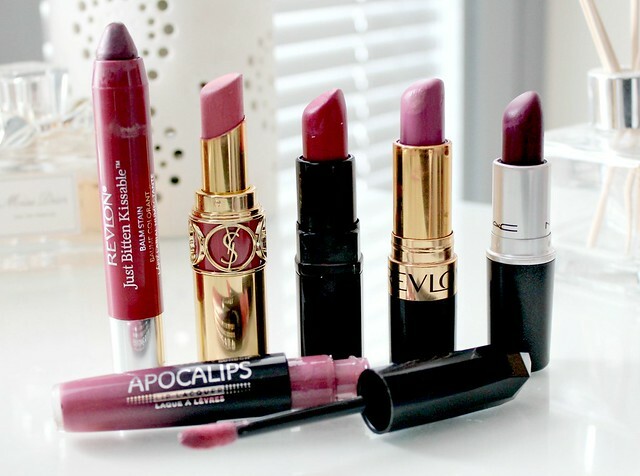 Great selection, I love berry shades! I love 107 by Kate Moss but after reading this post i am tempted to by MAC rebel. I also love the Revlon Balm Stains. I'm dying to try the new Revlon Matte lip crayons!